Every year problems related to overspending frustrate millions of families. So much of this irritation could be avoided if couples would work on developing a shared money maturity from the very beginning of their life together. 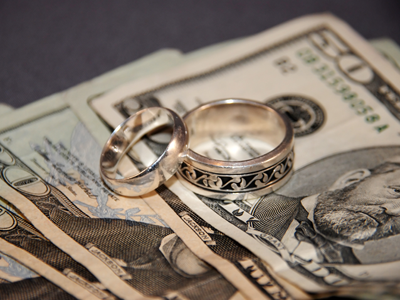 Developing healthy money habits as you begin your marriage requires honesty. In no area is the required transparency more obvious than when you begin looking at credit card and bank statements together. I have devised a series of five exercises that I have found to be most helpful in developing a shared money maturity as couples plan their life together. This exercise asks you to create a family budget together. Start with the assumption that you will pool your money. Couples enjoy an economic bonus because two can live more cheaply than both could alone. However, do not expect to achieve financial peace without a plan. I highly recommend that you plan to live on one salary for the first several years. This is a challenge that too few couples accept. If you max your lifestyle to pay for a mortgage, car payments, gym memberships, and the like, you will have no flexibility to adjust when children come. Your first years of marriage offer a great opportunity to save for an emergency fund and a down payment on your first house. Many great online tools are available for creating and monitoring your budget, but sometimes the best systems use a paper and pencil. My wife and I used the envelope system in our first year to track all discretionary expenses. Since then we’ve used an Excel spreadsheet and Mint.com. Start by tracking your current expenses to give you a starting point for creating your own budget. Budgeting is like healthy eating. You need to maintain balance and avoid excessive indulgences. Some helpful percentage spending guides are listed here. Going through this exercise will likely reveal who has the greater interest in paying the bills. In our family, my wife and I have passed this role back and forth as our personal schedules have gone from more to busy. Even when only one of you will be paying the bills, you can only build trust if you decide together how your money will be spent. Building the budget is the first step. Now you need to monitor your progress. Schedule times through the year to talk about money together. My wife and I picked up from good friends the practice of monthly “State of the Union” meetings. Money management should be one but certainly not the only topic at these meetings.